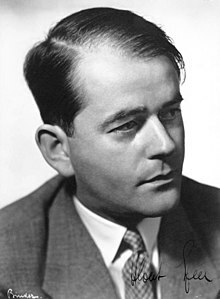 Albert Speer (/ʃpɛər/; German: [��ʃpeːɐ̯] ( listen); March 19, 1905 – September 1, 1981) was the Minister of Armaments and War Production in Nazi Germany during most of World War II. A close ally of Adolf Hitler, he was convicted at the Nuremberg trials and sentenced to 20 years in prison. An architect by training, Speer joined the Nazi Party in 1931, launching himself on a political and governmental career which lasted fourteen years. His architectural skills made him increasingly prominent within the Party and he became a member of Hitler's inner circle. Hitler instructed him to design and construct structures including the Reich Chancellery and the Nazi party rally grounds in Nuremberg. In 1937, Hitler appointed Speer as General Building Inspector for Berlin, in which capacity Speer was responsible for the Central Department for Resettlement that evicted Jewish tenants from their homes in Berlin. In February 1942, Speer was appointed as Reich Minister of Armaments and War Production. Using doctored statistics, Speer promoted himself as having performed an "armaments miracle" that was widely credited with keeping Germany in the war. In 1944, Speer established a task force to increase production of fighter aircraft that became instrumental in the exploitation of slave labor for the benefit of the German war effort. After the war, Speer was arrested and charged with the crimes of the Nazi regime among the 24 "major war criminals" at the Nuremberg trials. He was found guilty of war crimes and crimes against humanity, principally for the use of slave labor, narrowly avoiding a death sentence. Having served his full term, Speer was released in 1966. He used his writings from the time of imprisonment as the basis for two autobiographical books, Inside the Third Reich and Spandau: The Secret Diaries. Speer's books were a success, the general public was fascinated by an inside view of the Third Reich. Speer died of a stroke in 1981. Little remains of Speer's personal architectural work. Speer was born in Mannheim, into an upper-middle-class family. 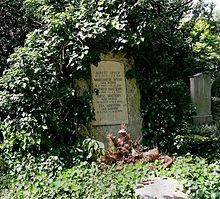 He was the second of three sons of Luise Máthilde Wilhelmine (Hommel) and Albert Friedrich Speer. In 1918, the family leased their Mannheim residence and moved to a home they had in Heidelberg. Henry T. King, deputy prosecutor at the Nuremberg trials who later wrote a book about Speer said "Love and warmth were lacking in the household of Speer's youth." His two brothers Ernst and Hermann bullied him throughout his childhood. Speer was active in sports, taking up skiing and mountaineering. Speer followed in the footsteps of his father and grandfather and studied architecture. Speer began his architectural studies at the University of Karlsruhe instead of a more highly acclaimed institution because the hyperinflation crisis of 1923 limited his parents' income. In 1924 when the crisis had abated, he transferred to the "much more reputable" Technical University of Munich. In 1925 he transferred again, this time to the Technical University of Berlin where he studied under Heinrich Tessenow, whom Speer greatly admired. After passing his exams in 1927, Speer became Tessenow's assistant, a high honor for a man of 22. As such, Speer taught some of Tessenow's classes while continuing his own postgraduate studies. In Munich Speer began a close friendship ultimately spanning over 50 years with Rudolf Wolters, who also studied under Tessenow. In mid-1922, Speer began courting Margarete (Margret) Weber (1905–1987), the daughter of a successful craftsman who employed 50 workers. The relationship was frowned upon by Speer's class-conscious mother, who felt that the Webers were socially inferior. Despite this opposition, the two married in Berlin on August 28, 1928; seven years elapsed before Margarete Speer was invited to stay at her in-laws' home. The couple would have six children together, but Albert Speer grew increasingly apart from his family after 1933. He remained distant even after his release from imprisonment in 1966, despite efforts to forge closer bonds. In January 1931, Speer applied for Nazi Party membership, and on March 1, 1931 he became member number 474,481. In 1931, with stipends shrinking amid the Depression, Speer surrendered his position as Tessenow's assistant and moved to Mannheim, hoping to make a living as an architect. Unsuccessful, his father gave him a part-time job as manager of the elder Speer's properties. In July 1932, the Speers visited Berlin to help out the Party prior to the Reichstag elections. While they were there, his friend, Nazi Party official Karl Hanke recommended the young architect to Joseph Goebbels to help renovate the Party's Berlin headquarters. When the commission was completed, Speer returned to Mannheim and remained there as Hitler took office in January 1933. Shortly after Hitler had come into power, he had started to make plans to rebuild the chancellery. At the end of 1933 he contracted Paul Troost to renovate the entire building. Hitler appointed Speer, whose work for Goebbels had impressed him, to manage the building site for Troost. 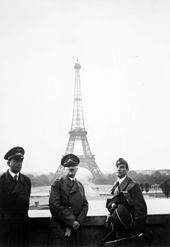 As Chancellor, Hitler had a residence in the building and came by every day to be briefed by Speer and the building supervisor on the progress of the renovations. After one of these briefings, Hitler invited Speer to lunch, to the architect's great excitement. Speer quickly became part of Hitler's inner circle; he was expected to call on Hitler in the morning for a walk or chat, to provide consultation on architectural matters, and to discuss Hitler's ideas. Most days he was invited to dinner. In the English version of his memoirs, Speer says that his political commitment merely consisted of paying his 'monthly dues'. He assumed his German readers would not be so gullible and told them the Nazi Party offered a 'new mission'. He was more forthright in an interview with William Hamsher in which he said he joined the party in order to save 'Germany from Communism'. After the war, he claimed to have had little interest in politics at all and had joined almost by chance. Like many of those in power in the Third Reich he was not an ideologue, although he was an avowed anti-semite. The historian Magnus Brechtken discussing Speer said he did not give anti-Jewish public speeches and that his anti-Semitism can best be understood through his actions – which were anti-Semitic. Brechtken added that throughout his life Speer's central motives were to gain power, rule and acquire wealth. When Troost died on 21 January 1934, Speer effectively replaced him as the Party's chief architect. Hitler appointed Speer as head of the Chief Office for Construction, which placed him nominally on Hess's staff. One of Speer's first commissions after Troost's death was the Zeppelinfeld stadium in Nuremberg. 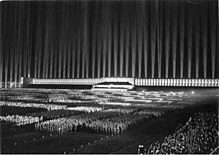 The stadium was used for Nazi propaganda rallies and can be seen in Leni Riefenstahl's propaganda film Triumph of the Will. The building was able to hold 340,000 people. Speer insisted that as many events as possible be held at night, both to give greater prominence to his lighting effects and to hide the overweight Nazis. Nuremberg was the site of many official Nazi buildings. Many more buildings were planned. If built, the German Stadium would have accommodated 400,000 spectators. Speer modified Werner March's design for the Olympic Stadium being built for the 1936 Summer Olympics. He added a stone exterior that pleased Hitler. Speer designed the German Pavilion for the 1937 international exposition in Paris. On February 8, 1942, Minister of Armaments Fritz Todt died in a plane crash shortly after taking off from Hitler's eastern headquarters at Rastenburg. Speer arrived in Rastenburg the previous evening and accepted Todt's offer to fly with him to Berlin. Speer cancelled some hours before take-off because the previous night he had been up late in a meeting with Hitler. 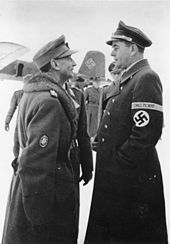 Speer was appointed in Todt's place by Hitler. Martin Kitchen, pointed out that the choice was not surprising. Speer was loyal to Hitler, and his experience building prisoner of war camps and other structures for the military qualified him for the job. Hitler also appointed Speer as head of the Organisation Todt, a massive, government-controlled construction company. As head of Organisation Todt Speer was directly involved in the construction and alteration of concentration camps. He agreed to expand Auschwitz and some other camps, allocating 13.7 million Reichsmarks for the work to be carried out. This allowed an extra 300 huts to be built at Auschwitz increasing the total human capacity to 132,000. Included in the building works was material to build gas chambers, crematoriums and morgues. The SS called this "Professor Speer's Special Programme." Speer believed he could win the war by producing enough weapons to overcome the Allies, something that he believed only possible if he was given economic control of Germany. Speer was fêted at the time, and long afterwards, for performing an "armaments miracle" in which German war production dramatically increased. 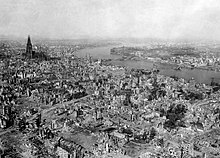 This "miracle" was brought to a halt in the summer of 1943 by, among other factors, the first sustained Allied bombing. Other factors probably contributed to the increase more than Speer himself. Germany's armaments production had already begun to result in increases under his predecessor, Todt. Naval armaments were not under Speer's supervision until October 1943, nor the Luftwaffe's armaments until June of the following year. Yet each showed comparable increases in production despite not being under Speer's control. Another factor that produced the boom in ammunition was the policy of allocating more coal to the steel industry. Production of every type of weapon peaked in June and July 1944 but there was now a severe shortage of fuel. In September 1944 the Roumanian oil fields came into the range of bombers from the USAAF. Oil production became so low any possibility of offensive action became impossible. As Minister of Armaments Speer was responsible for supplying weapons to the army. With Hitler's full agreement he decided to prioritize tank production and he was given unrivaled power to ensure success. Hitler was closely involved with the design of the tanks and kept changing his mind about the specification thus delaying the program, Speer was unable to remedy the situation. In consequence, despite tank production having the highest priority relatively little of the armaments budget was devoted to tank production. This led to a significant German army failure at the Battle of Prokhorovka, a major turning point on the Eastern Front against the Russian army. The largest technological advance under Speer's command came through the rocket programme. The programme had begun in 1932 but hadn't supplied any weaponry. In March 1942 Speer made an order for A4 rockets, the predecessor of the worlds first ballistic missile, the V2 rocket. The rockets were researched and built at a facility in Peenemunde along with the V-1 flying bomb. The programme while advanced proved to be an impediment to the war economy. The large capital investment wasn't repaid in military effectiveness. When Speer sought the appointment of Hanke as a labor czar, Hitler, under the influence of Martin Bormann, instead appointed Fritz Sauckel, who obtained workers for (among other things) Speer's armament factories, often using the most brutal methods. The two men cooperated closely to meet Speer's labor demands. That Speer was not Sauckel's superior and the two men often differed probably saved Speer's life at the Nuremberg Trials. Hitler gave Sauckel a free hand to obtain labor, something that delighted Speer, who had requested 1,000,000 "voluntary" laborers to meet the need for armament workers. By April 1943 Sauckel had supplied 1,568,801 "voluntary" laborers, forced laborers, prisoners of war and concentration camp prisoners to Speer for use in his armaments factories. It was for the mistreatment of these workers that Speer was principally convicted at the Nuremberg trials. In mid-January of 1944, Speer fell seriously ill with complications from a knee injury. Concerned about retaining his power, Speer did not appoint a deputy and continued to direct work of the Armaments Ministry from his bedside. Speer's illness coincided with the Allied "Big Week", a series of bombing raids on the German aircraft factories that were a serious blow to aircraft production. In response to the Allied air raids, Adolf Hitler authorized the creation of a Jägerstab, a governmental task force composed of Reich Aviation Ministry, Reich Ministry of Armaments and SS personnel. Its aim was to ensure the preservation and growth of fighter aircraft production. The task force was established by the 1 March 1944 order of Speer, with support from Erhard Milch of the Reich Aviation Ministry. Production of German fighter aircraft more than doubled between 1943 and 1944, though this was within Milch's domain and consisted in large part of models that were becoming obsolescent and proved easy prey for Allied aircraft. On 1 August 1944, Speer merged the Jägerstab into the Rüstungsstab (Armament Staff). The formation of the Rüstungsstab allowed Speer, for the first time, to consolidate key arms manufacturing projects for the three branches of the Wehrmacht under the authority of his ministry, further marginalising the Reich Ministry of Aviation. The Jägerstab was instrumental in bringing about the increased exploitation of slave labor for the benefit of Germany's war industry and its air force, the Luftwaffe. The task force immediately began implementing plans to expand the use of slave labor in aviation manufacturing. 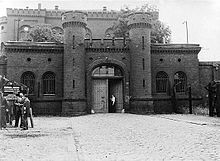 Records show that the SS provided 64,000 prisoners for 20 separate projects at the peak of Jägerstab's construction activities. Taking into account the high mortality rate associated with the underground construction projects, the historian Marc Buggeln estimates that the slave pool involved amounted to 80,000−90,000 inmates. They belonged to the various sub-camps of Mittelbau-Dora, Mauthausen-Gusen, Buchenwald and other camps. The prisoners worked for Junkers, Messerschmitt, Henschel and BMW, among others. In order to increase production Speer introduced a system of punishments for his fighter staff workforce. 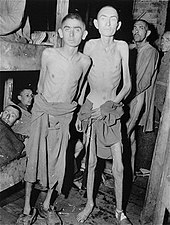 Those that feigned illness, slacked off, sabotaged production or tried to escape were denied food or sent to concentration camps. In 1944 this became endemic, over half a million workers were arrested. By this time 140,000 people were working in Speer's underground factories. These factories were death-traps, discipline was brutal, with regular executions. At the Dora underground factory there so many corpses that the crematoria was overwhelmed. Speer's own staff described the conditions there as "hell". By April little was left of the armaments industry, and Speer had few official duties. Speer visited the Führerbunker on April 22 for the last time. He met with Hitler and toured the damaged Chancellery before leaving Berlin to return to Hamburg. On April 29, the day before committing suicide, Hitler dictated a final political testament which dropped Speer from the successor government. Speer was to be replaced by his subordinate, Karl-Otto Saur. Speer was disappointed to have not been selected by Hitler as his successor. After Hitler's death, Speer offered his services to the so-called Flensburg Government, headed by Hitler's successor, Karl Dönitz, and took a role in that short-lived regime as Minister of Industry and Production. Speer provided information to the Allies regarding the effects of the air war, and on a broad range of subjects, beginning on May 10. On May 23, two weeks after the surrender of German forces, British troops arrested the members of the Flensburg Government and brought Nazi Germany to a formal end. ^ Kitchen 2015, p. 122. ^ Kitchen 2015, p. 221.